The special one-off club night will feature one of LA’s most sought after spinners, DJ Michaelis, and Bali favourite Syviov, who will be playing a mix of alternative R&B & hip-hop tracks all night. 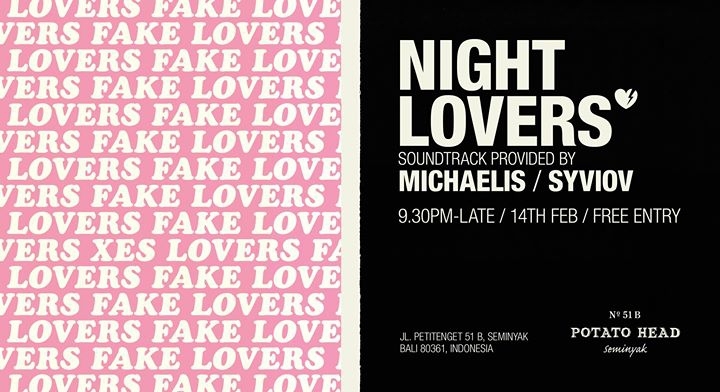 Inspired by “Fake Love,” a hit by grammy award-winning Canadian hip hop artist Drake, Night Lovers is aimed at anyone looking for a genuine party this Valentine’s Day – singles, couples, friends and lovers. With an appreciation for a wide range of musical genres from a young age, DJ Michaelis’ diverse style traverses the realms of funk, soul, hip-hop, grunge, heavy metal, dance and drum & bass. Since honing his mixing skills around 20 years ago in the lively club scene of Tel Aviv, DJ Michaelis has made a name for himself in the Los Angeles clubbing circuits, being called upon to make guest DJ appearances at countless high profile events and contributing his time to play at alcohol and drug free events across the country, a cause which he has been personally affected by. He currently holds up residencies in some of LA’s hottest clubs, including Supperclub Hollywood, Lure Hollywood, XIV Hollywood, Chateau Las Vegas and American Junkie Chicago. He’s also the official NASCAR DJ touring periodically around The States. A regular behind the decks at Jenja, Old Man’s, Pretty Poison and other Bali venues, local boy Syviov is no stranger to the island’s party scene. With personal music tastes spanning ‘80s funk, classic rock, reggae, soulful house and hip hop, his trademark sets blend funk synth work, epic bass lines and foot thumping beats.